Disclosure: I partnered with NEUTROGENA for this post and received compensation. All opinions expressed are my own. I had horrible acne when I was a teenager. I don’t think there was ever a time that I didn’t have a pimple on my face. It made me feel self-conscious and I tried my best to cover them up with make-up. I longed for beautiful, clear skin. Even today at 39 years old, I am still dealing with breakouts. Thankfully, age has helped and I’m not getting as many as before, but it’s still very annoying. Both my daughter’s have my oily skin. Olivia, the oldest, has been dealing with acne for years and my youngest, Bridget, is just starting to get pimples on her face. I blame puberty and genetics. 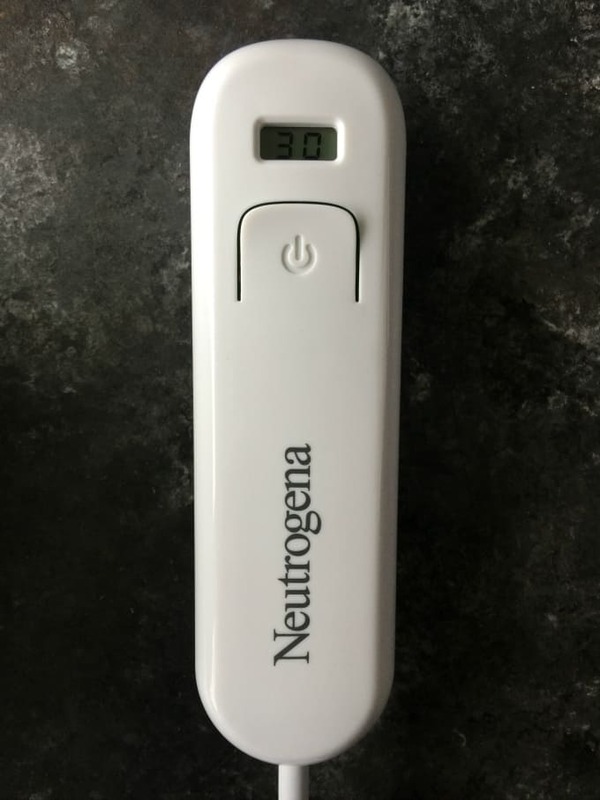 I recently learned about a new product from NEUTROGENA® that is a new, innovative way to fight acne: the NEUTROGENA Light Therapy Acne Face Mask. They are taking the fight of acne to a whole new level with this product and I couldn’t wait to try it with my daughter. It uses the science of light to fight acne in the comfort of your own home. 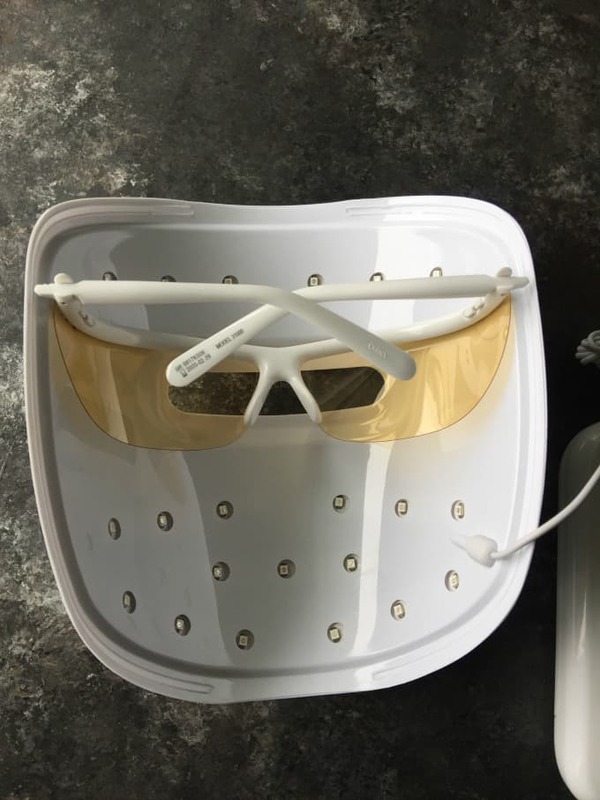 The Light Therapy Acne Mask is an LED device that treats your face in one easy step using therapeutic red and blue wavelengths into your skin at the speed of light. 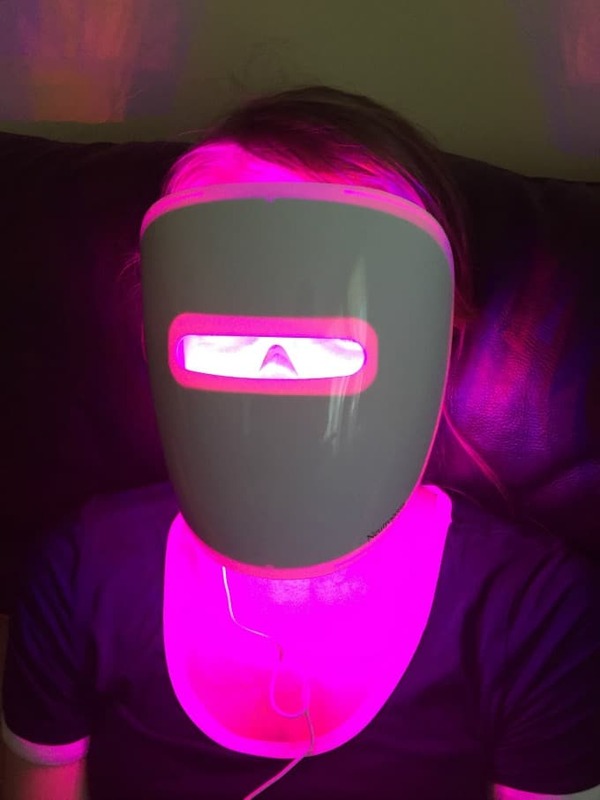 The red light reduces inflammation while the blue light targets acne-causing bacteria. The combination helps disrupt the acne cycle to give you clearer, healthier skin. I think what I love the most about it is that it’s so easy to use. You use it daily after washing your face by simply putting it on your face and pressing the activator button. It comes with a NEUTROGENA Light Therapy Acne Mask Activator that includes 30 – 10 minute treatments. After you’ve completed your 30 sessions, you can recycle your Activator at no cost to you. Visit the NEUTROGENA Light Therapy Acne landing page and click on the recycling icon and get a pre-paid shipping label. I wish this product had been around when I was a teen! However, I’m glad it’s here now that my youngest is a teen and just starting to deal with acne. It’s another powerful tool in our skincare routine to treat acne and prevent future breakouts. Bridget thought it was “super cool” how it lights up and changes colours. She says it is comfortable to wear and has been using it daily before bed. She either reclines on the couch with it on or lays in her bed for 10 minutes. She keeps her eyes closed throughout the process. So far so good! Her skin is starting to look better and I think the mask is helping her breakouts. I can’t wait to see what the coming weeks bring the longer we use this product. You aren’t supposed to share the product so it’s one mask per person. My oldest is away at university and I’m going to tell her to pick one up so she can try it too. Want to try one out? You can find the NEUTROGENA Light Therapy Acne Mask at stores nationwide starting this month (September 2017). They retail for $45.99 to $49.99 and include the mask and 30 session Activator. Once you’ve used up your 30 sessions, pick up an Activator for $19.99 to $21.99. 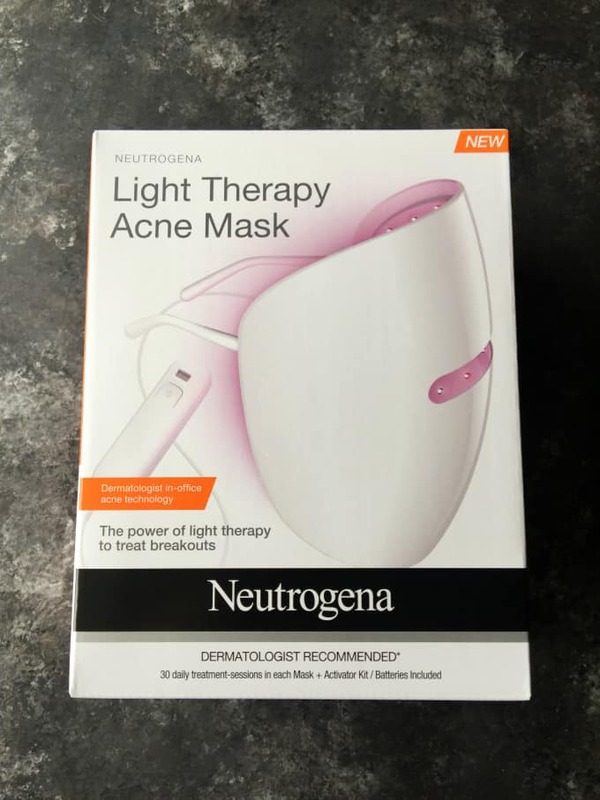 If your teen (or even yourself) has acne, consider giving the NEUTROGENA Light Therapy Acne Mask a try! Do you have a teen that suffers from acne? I’m interested in hearing about the results your daughters have with this product. As a teen and young adult I would have loved to have a product that eliminated my acne. I have heard about this mask! It sounds so cool! My poor stepson is struggling with acne, so I think I am going to get one of these masks for him. I am sure he’d appreciate the help! I have heard so many good things about light therapy for acne. I need to get this for my kids. They’re ALL just about at the age where this could be an issue. Whoa! Now that’s interesting -I’d never seen anything like that or even heard of light therapy. Now I’m totally interested in checking it out more because my skin could use it! I do not see through that badly from acne but my husband does. I am always interested in trying new things for acne. I’m very interested in seeing if this works. I would really like to hear from someone who has used this for a while, to see if it works well. I’ve been looking at it for a while, but have been hesitant to get it. I’m looking forward to seeing how her skin looks after using it for a while! I’ve been eyeing this for one of my kiddos and the reviews I’ve read have been really promising! I have been thinking about getting one of these for my teenager. It looks like it may be a better approach then getting a prescription cream! Wow, that thing is amazing! I’ll have to remember that when my younger kids get older. This sounds like such a cool system. I’m liking the benefits of the different kinds of light. It seems like this would be easy to fit into the routine too. I would be so interested in trying this make out for myself. It looks like a really cool gadget. That’s a very interesting mask. Sounds really neat too. I like this idea a lot better than most others. Acne treatment has come a long way. I hadn’t heard of using light therapy. I can’t wait to hear how it works for your daughter after the 30 days. I never even knew that they made this product. I really need to look into something like this. I am all into light therapy. 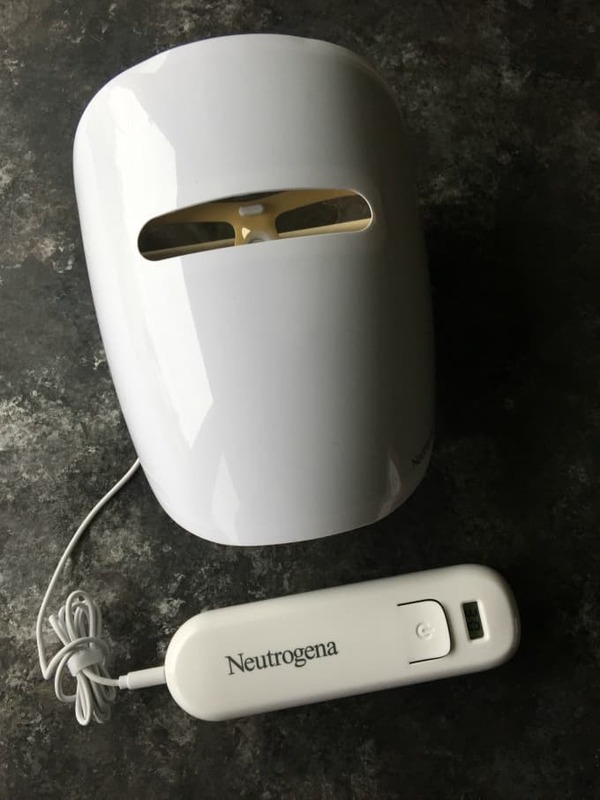 I wish that the NEUTROGENA Light Therapy Acne Face Mask was around when I was a teenager. I think this looks so cool! Wow! This looks amazing! I would love to try this! This sounds really interesting! I need to look this! I am seeing these on sale here at Target in the states and I was wondering what it did! Looks like a cool options! This is such a cool idea! I plan on getting one soon for my 17 year old to try.